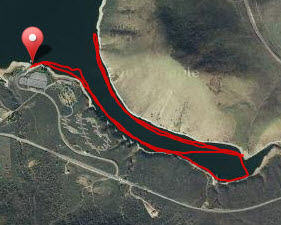 We had a great time last night at the Utah Open Water group swim at Deer Creek reservoir. I had anticipated a group of about 7 people but, for various reasons, many people had to cancel and it ended up being just Gordon Gridley and myself. The water was perfect. Gordon's thermometer showed 73 degrees which is much better than what we have been swimming in at Bountiful Lake. We started the swim at about 6:30pm. At that time, and probably partly due to the windy weather, there were not many boats or other people there. We started out swimming easterly from the boat ramp down Walsburg Bay. The wind started picking up after we reached the end of the bay and turned to go back towards the direction of the boat ramp. It was a good experience for both of us to swim through choppy water and I think we both learned that it is best to stay relaxed rather than try to fight the water. It also helped to swim with higher elbows and really try to reach as far as possible. Even with adjusting my technique I still swallowed a few mouthfulls of water. We swam back to the opening of the bay and decided to head back the way we came. The water was fairly calm once we got back into the bay until about the last mile or so when the wind picked up again and we got a chance to practice rough water swimming again. I wish I would have brought a waterproof camera to take a picture of the sunset from the water. That is one of the reasons I love open water swimming. When will you ever see a sunset while swimming in a lap pool? I started thinking about tying a waterproof camera around my neck when I swim from Alcatraz later this month. According to my GPS which I kept in my cap, Gordon and I swam 4.39 miles in about 2 hours 24 minutes (not bad considering the rough water). For those who missed the swim, we will have to get together another time after the Deer Creek Open Water Marathon Swim on August 15th.